Due to limited supply, all products are sold on a first-come first-serve basis. Auto Notification does not guarantee either availability or price. All prices are subject to change without notice. *Your information will only be used to notify you when this item becomes available. Does this need drivers? My DAW (Pro Tools) and Mac aren't recognizing it. BEST ANSWER: Drivers should not be needed. Check the mac's preferences and be sure you see it. ProTools does not always play nicely with non-Avid hardware. If you have trouble with the mac recognizing then please contact our Tech Support team. I hope my answer will somehow be helpful, although my equipment is rather obsolete. I still have the xp so you can imagine what kind of software I use for now. But anyways, to answer to your question, as far as I know there are no drivers for this mixer. At least none that I know off. I plugged it and it worked. I am using Cubase Le4 so I did a little bit of tweaking around Device Setup and VST connections in order select the inputs and the outputs. It is important to know that the result will be a mix between the instruments you plugged into the mixer and not separate audio files for each channel. You may be able to record on separate channels two instruments played in the same time (ex. : guitar and drum machine) by turning the Pan of one instrument completely to the left and the other Pan completely to the right. It works but it's a bit annoying to hear them this way in the headphones. If someone knows a different way to record please post a more complete answer here. I hope this was helpful. I didn't need any drivers on 10.12. This appears to be class compliant as far as I can tell. Have you tried a different cable and made sure the Tape/USB to mix button is not turned on? I would also recommend testing with a port directly into your Mac rather than via a hub as some USB hubs (especially some USB 3.0 ones) will have issues registering the device correctly. My Mac recognized the Mixer first time I used it with zero latency. The driver was standard USB audio. Windows took more fiddling, had to delete all existing drivers and exhibits some latency still. I'm fairly new to using equipment like this mixer. Is it possible to get audio from an audio card 1/8th in out and output through the mixer headphone jack? BEST ANSWER: Yes, with the right cables it will accept audio from the typical computer 1/8" stereo output. The cable I reference below is available here in several lengths. I use the same cable with iPad as well. However, for sound out of a computer, you don't need to use the computer's sound card, because the mixer will also attach via USB and contains it's own USB sound card using a standard USB cable. I don't recall if the USB cable came with it or not, so I reference one of those as well. Hey Jeffrey, I whipped out a 1/8 into dual RCA cable from an old camera and connected that to the tape in RCA inputs and toggled on the mix to aux/phones. My brain must have been foggy, because looking at it again it was clear that it should work this way. The reason I wanted to send from my pc audio card is I have an Asus DGX card in my pc and wanted to send that signal through the mixer to my ATH m50 headphones. 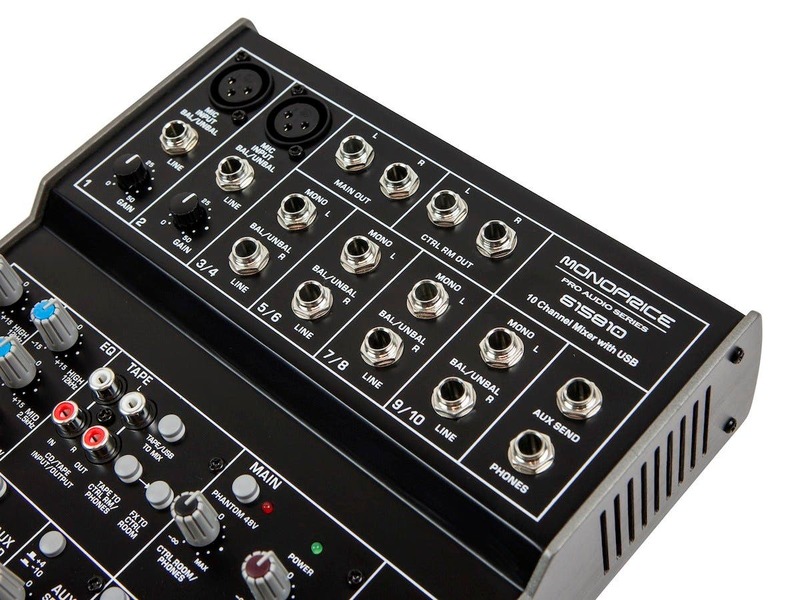 What ports on the mixer are you using for the dual 1/4 in from 1/8 in from the iPad connection? Since most of the inputs and outputs are 1/4" TRS , you would need a 1/8 (3.5mm) to 1/4" female to male adapter similar to Monoprice item Product # 7139 for both the input and the output. Yes but no need to do that it has usb built in so you can get audio in and out using via usb. But either way will work. Does this only output as Mono through the headset? I can only seem to get a mono mix. BEST ANSWER: The headphone output is stereo. Be sure your cables are plugged all the way in to the jack. Check to see if the PAN and BAL knobs are in the center position. If the problem persist please contact customer support for a return authorization and replacement. No, the headphone output is stereo. But the AUX mix is not stereo. Are you using the aux sends to make a separate headphone mix? Does this work with Linux? BEST ANSWER: We have not tested on Linux systems. It is a standard plug & play usb audio device. I am sure someone in the Linux community has come up with a driver that will work. There is no reason it wouldn't work if the right "USB audio media" drivers were available for a Linux machine. I'm not a Linux expert, but I have a high degree of respect for linux. Someone has probably written a driver for linux. Will this work for live gigs? Dynamic mics and guitars? 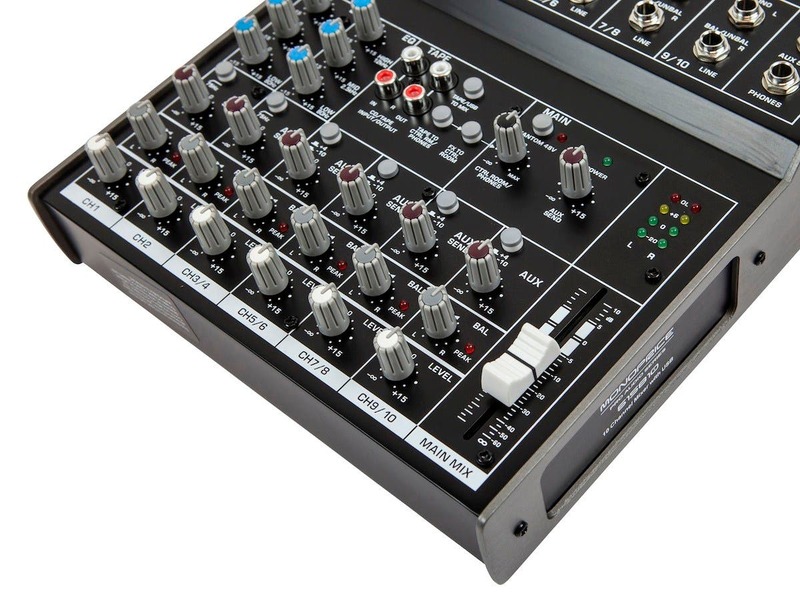 BEST ANSWER: Yes, this mixer is actually more suited to hi-z, unbalanced instruments (e.g., drum machines, synthesizers, electric guitars, dynamic mics, etc.) than it is to low impedance devices like studio condenser mics because ALL but TWO of the inputs are line level (hi-z). Yes and it has phantom power for mic tgat require it. I love this unit. Does this have multichannel audio output through USB? Can it record separate inputs to multiple tracks in garageband? 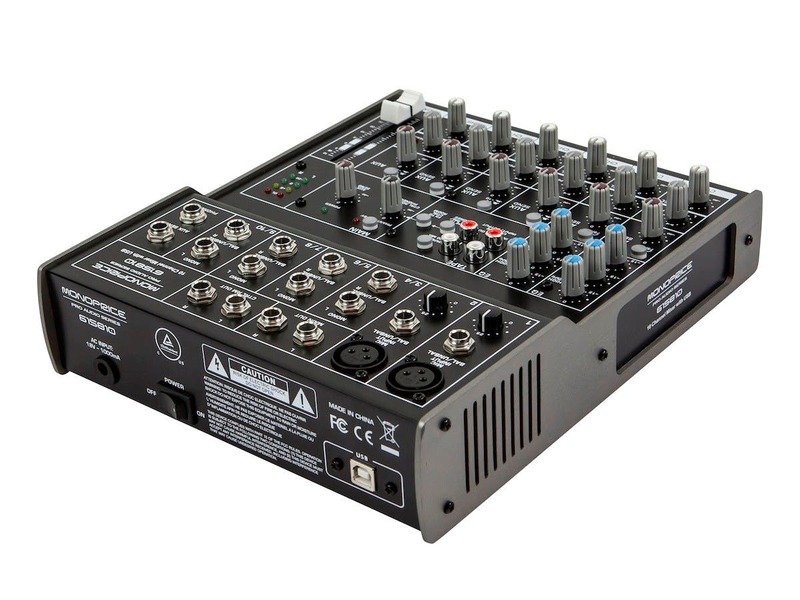 BEST ANSWER: Thank you for your interest in this USB mixer. This mixer can be used to record 2 tracks of audio to most DAW recording software. Adjust PAN knobs to full Left and Right to isolate input channels to record to separate tracks. It has a single mix output via USB. The same is true for input. Only one input from USB. 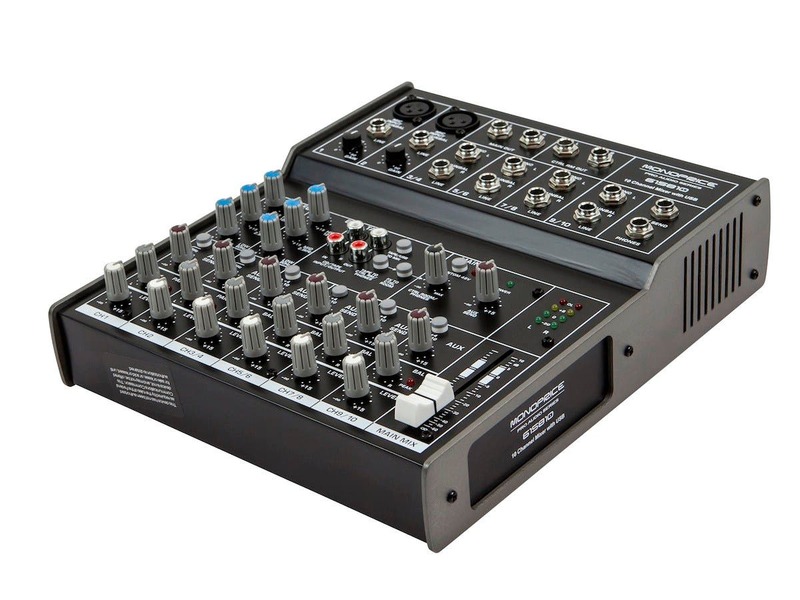 Is this a good mixer to use for recording via USB, to a computer, utilizing multiple mic inputs (host and guest) for a podcast? If so, how would I set that up? BEST ANSWER: It should do just fine! I currently use mine with my band, we have used it to record drum tracks and use it for a PA for jam sessions, it does a pretty decent job. All you would need is recording software, then plug this mixer in via the usb then you should be good to go. Keep in mind what's plugged in to mixer will only be one track once recorded on the computer. Hope this helps! Yes, you can configure it for that, you put your speakers on the "control room" output, not the main output (because the main mix is what goes into the computer), and set the switches so that only the computer output goes to the speakers. (That's the configuration I use for Skype or Media Composer punch-in.) This is to prevent echo and feedback, and because it is mixing/panning the microphones, you only need one channel into your podcast recording software. Although, that is not this mixer's strength. The strength here is the versatility to bring in multiple computers, phones, tablets, keyboards, or whatever, with just one or two microphones. 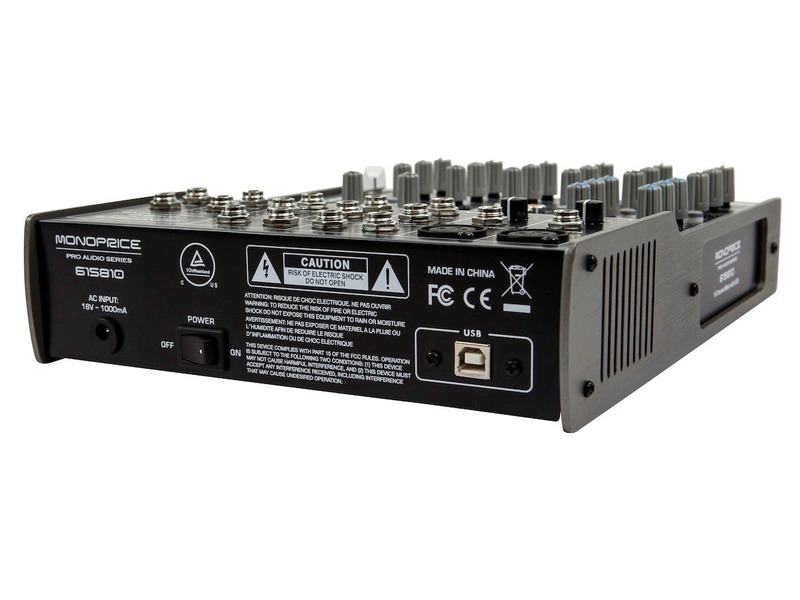 If you don't need the multiple stereo line level inputs, you might do better with Monoproce's other 8-channel mixer (same price), that has four mic inputs (in case you have two guests at once), and just two line level inputs. Does this unit have any hi-z input for plugging in an electric guitar? BEST ANSWER: No dedicated HiZ ins. I plug in to ch 1 or 2 and use the gain knob. Not so far as i know, you would use a DI box as with most analog boards. Will the power adapter work with 220V 50hz AC input? I would purchase a step-down transformer to go from 220 to 110 then use as normal. Is this unit fully compatible with Windows 10? BEST ANSWER: Yes and it works great and sounds fantastic. It a home studio must have, don't let the price fool you this is top of the line. Can this be powered by usb only? BEST ANSWER: This cannot be powered by just the USB. You will need to use the adapter as well. Where do I download the usb drivers? BEST ANSWER: If you happen to be using Linux, you won't need to download drivers. It will show up as an audio input/output option automatically. Would this be the same then for windows? It wont show up as a device on my system. If I set the mixer USB port as the input and output, set the USB to go to the main output, and connect monitors to the main output, will I be able to do an audio recording without hearing the output of the computer? If not, how will I be a able to do that? Please let me know if my questions isn’t clear and I’ll try to clarify. BEST ANSWER: What you asked is very easy. If you connect as you described, you deselect the "TAPE/USB TO MIX" button. This way you will not hear or record ANY computer generated audio output. You will, however, hear the material you are recording out the speakers. This configuration is good if, for example, you just want to record from another source like your phone's headphone jack, a CD player, or a keyboard instrument. If you are recording with a microphone, this configuration works better if you wear headphones, and turn off your speakers to prevent feedback, because the microphone could pick, up the sound from the speaker, and that's generally not good. What's more difficult is to hear the computer audio while recording only the live material. To do that, you have to connect the outputs to "control room" instead of "main output", select "TAPE TO CTRL RM" deselect "TAPE/USB TO MIX". In this configuration the mixer inputs are being recording, but the computer's output is not. You are hearing only the computer's output, so if the computer issues looping the input back to the output, you will still hear the inputs. That loopback, however, is under the computer's control and in most recording software can be turned down or off as needed. Is the USB class compliant? Could it work on a iPad with the camera kit? BEST ANSWER: The USB is class compliant. I have never used with iPad. The mixer is great for everything a mixer should be. The class compliant usb interface, although having some hum, is great for simple recording onto iOS devices (with proper adapters). For the price, it cannot be beat. This mixer beats every mixer I tested for under $200 for what I wanted. It feels extremely solid, the fader is high quality as are the knobs. I have virtually no noise with this mixer either. Every connection feels extremely solid. 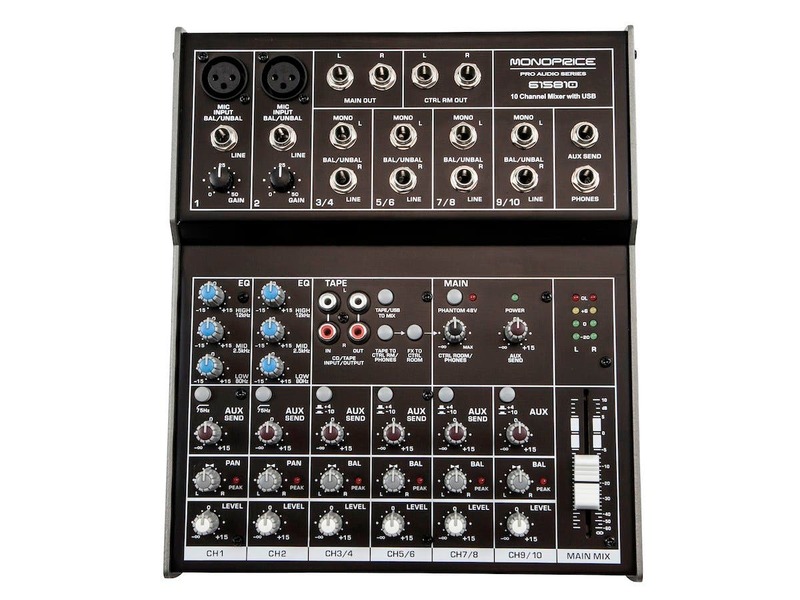 If I need another mixer, I'll definitely buy another from Monoprice. The mixer looks exactly as presented and performs pretty good. I am not an expert but as far as I tested it is a good investment. I have an Mac and a PC and two sound systems in the ame room. It was too complicated to hook up everything through computers only. Why two sound systems ? One is small and the other is a full 5.1 surround sound - good for movies and large scale spectacles. essential if most of your devices have 3.5 stereo jacks. Also if you plan to place it horizontally rather than vertically, the on/off switch i inconveniently at the back - so get a cheap outlet extension to make that more convenient. Great addition to any home studio. Solid and fairly heavy unit so it doesn't move around, knobs are high quality. No issues with noise. Audacity recognized the hardware immediately. Love it. The unit works okay but is very limited as to what it can do. For what I needed it for the 8 channel unit probably would have worked better. I have my keyboard, a microphone, guitar, head set, and a small amplifier hooked up to it. It distributes the signal and sound very well. I have good control over all inputs. It works very well for my home studio room where I do a little of recording and for small gigs. The controls have good range, the pushbuttons makes the configuration very flexible, just the right combination of inputs for a desk with multiple sources (PC, radio, iPad, etc) and still have a mic input for recording voiceovers. Best mixer under $100 available. Rock solid design, plenty of inputs for a band, everything works as advertised with NO HUM! USB recording to stereo works great. Incredible value. Hands down best mixer under $100.00. Impressive build quality, simple yet feature packed interface, and of course arrived very well packaged and early.